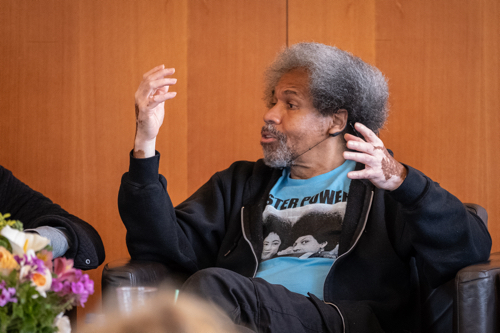 Mass incarceration, solitary confinement, and the possibility for meaningful change in the American prison system took center stage in the standing-room-only Bhojwani Room of the University Center on May 22. Distinguished Professor of Psychology Craig Haney introduced the panel of speakers by saying all four have experienced the criminal justice system from the inside and now devote their lives to its abolition. Angela Davis was held in prison for 16 months before she was acquitted of the charges related to a 1970 shooting. Debbie Kilroy spent three years locked up for selling cannabis during an undercover police sting in Australia. Robert King and Albert Woodfox served a total of 72 years in solitary confinement — 29 years for King and 43 for Woodfox — at Louisiana’s notorious Angola Prison. On display was a large photo of the third member of the “Angola 3,” Herman Wallace, who died of cancer three days after he was released. All three were imprisoned in 6-foot-by–9-foot cells at what was once a 19th-century slave plantation. “It’s helpful to recognize that punishment in the form of imprisonment bears a direct relationship to slavery,” said Davis, an iconic activist and distinguished professor emerita at UC Santa Cruz. Davis was a professor in the History of Consciousness Department for 17 years until her 2008 retirement. The emergence of what’s called mass incarceration can be traced back to the 19th century, right after slavery was outlawed, when “free black bodies had to be managed,” she said. Now the United States, with just 5 percent of the world’s population, has 25 percent of the world’s prisoners—or 2.2 million people in jails, detention centers and prisons, and a disproportionate number of them are black. Haney, a leading expert on the psychology of imprisonment, suggested that today’s prison system has more than a historical or metaphorical connection with slavery. When it comes to solitary confinement, what was created as a means of punishment became the warehousing of a segment of society, said Woodfox, who was released in 2016 after being in confinement since 1972. Initially jailed for armed robbery, Woodfox was later charged with the murder of a prison guard. Eventually, judges upheld unanimously that his murder conviction had been secured as a result of racial discrimination. She calls for a transformation of society so it no longer relies on prison repression, describing a process of “discovering, imagining, creating a form of justice that heals” and ends the cycle of retribution. Davis said social activists everywhere help this cause when they advocate for better education and housing, and address gender violence.